Wisconsin mobilization against proposed anti-immigrant laws | Fight Back! 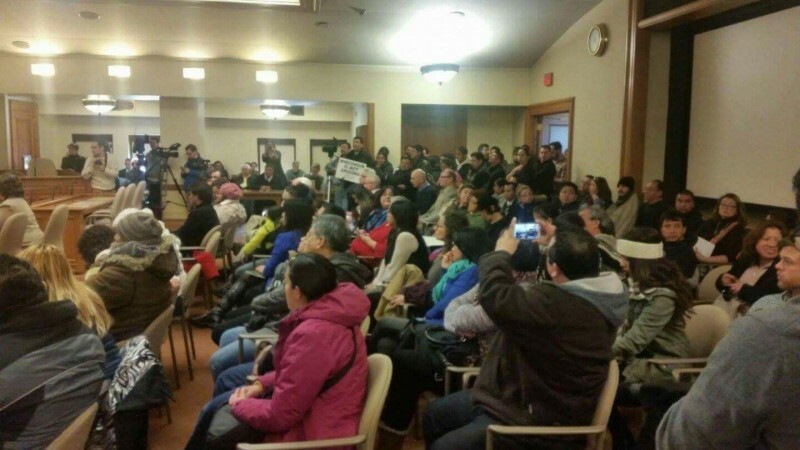 Madison, WI – 200 community members organized by the Milwaukee based Voces de la Frontera and Youth Empowered in the Struggle (YES) traveled to the state capitol in Madison to oppose anti-immigrant legislation on Jan. 20. There are three bills in the assembly currently targeting immigrants: AB-450, AB-533 and LRB-2818. AB-450, if passed, will prevent city and county resolutions that prohibit immigration status inquiries from local authorities. This bill will allow local authorities and Immigration and Customs Enforcement (ICE) to collaborate by giving local officials authority to begin enforcement actions, as well as informing other units of government about the presence of undocumented immigrants. AB-450 has been referred to the Committee on Urban and Local Affairs. The second bill, AB-533, is a direct response to the victory the Milwaukee immigrant community had only a few months ago, when the city and county governments approved of issuing state IDs to undocumented immigrants. AB-533 would prohibit cities and counties from creating such identification cards that can be used for basic personal information to establish proof of residence or obtain health services. LRB-2818, the third anti-immigrant bill, will prevent people without a license to register vehicles under their name. This bill will not only impact the undocumented people, but also those who do not have a driver’s license. Florencio Mondragon, a community member who attended the Jan. 20 hearing, demanded representatives oppose LRB-2818. Florencio said, “Work is far from where I live, a car is important to have especially in the winter times. The town I live in is small, and there is not much public transportation available. Authorities should be focusing on the real issues and crimes. This is not a fair way to treat people. I contribute to the state by paying taxes and staying out of trouble, I just want to live a simple life. 2016 has begun with anti-immigrant action and rhetoric coming from all levels of the state government, as well as the Republican presidential candidates. Groups like YES and Voces will continue to mobilize in opposition to these three bills, both at the state capitol and in the streets.